For three days starting September 14, nearly 10,000 workers from Luoyang White Horse Group, Co., formerly the Luoyang Cotton and Textile Factory, demonstrated along Shachang Xi Street and Zhongzhou Street to protest corruption among the company leaders. 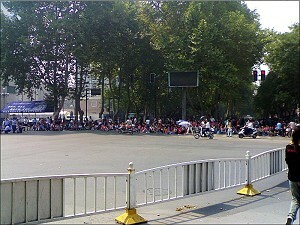 Over 1,000 police were dispatched to suppress the movement. Police beat a number of workers. During an interview on September 17, several workers told The Epoch Times that during a staff meeting last Friday, company executives stated that the company was in bankruptcy and would undergo restructuring. They would provide assistance of 1,220 yuan ($162) per year for each laid-off worker. Workers, who have long been dissatisfied with corporate corruption, gathered in groups to protest. Phone calls to White Horse Group were unanswered. Mr. Zhao also said that many workers tried to publish up-to-date information on the Internet, but the posts were deleted by the government immediately after posting. Luoyang White Horse Group engages in textiles, clothing, medicine, real estate, mechanical engineering, and trade transactions. It was previously known as the Luoyang Cotton and Textile Factory, founded in 1958. Currently Luoyang White Horse Group has 16 subsidiaries and over 10,000 employees.